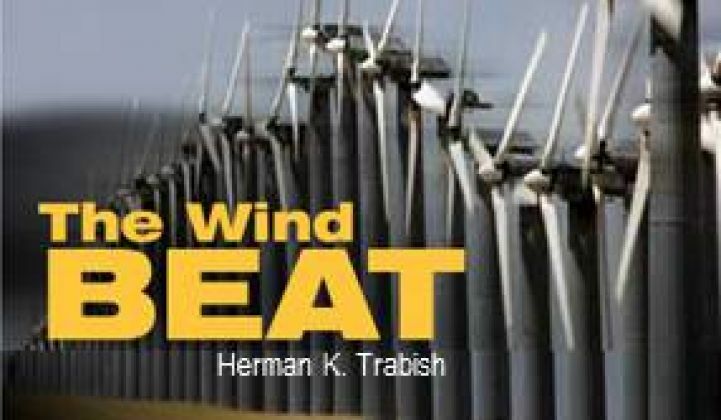 It is not yet clear whether the November 6 Obama presidential victory will fulfill wind insiders’ repeated predictions that the industry’s vital 2.2 cents per kilowatt-hour production tax credit (PTC) would be extended with the election decided. Newly re-elected President Obama has said he wants to make the PTC permanent. But that will require the cooperation of a still-divided Congress that will now include Democratic Senator-elect Elizabeth Warren and conservative Republican Senator-elect Ted Cruz.. Even if the PTC is extended, industry watchers agree, 2013 is a lost cause for manufacturing and development. Uncertainty surrounding the incentive has already put companies on hiatus, shuttered facilities and caused an estimated 10,000 announced layoffs. It will take twelve months to twenty-four months to get the industry geared up and producing again. 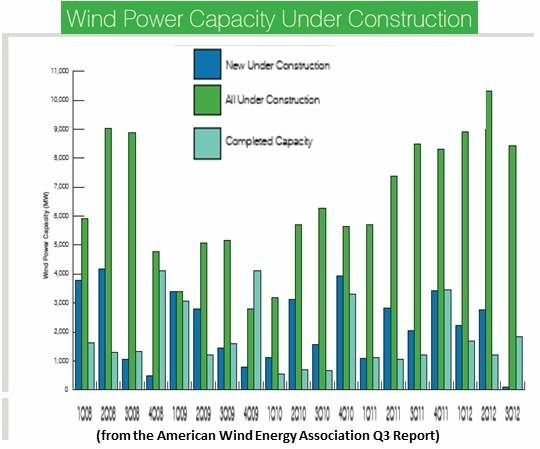 The December 31 expiration of the PTC has driven what the American Wind Energy Association’s Q3 2012 report described as a potentially record-breaking year. Wind built 1,833 megawatts in the most recent quarter, bringing the year’s total to 4,728 megawatts and the U.S. cumulative capacity to 51,630 megawatts. With over 8,400 megawatts still in construction, the year’s total could top 13,200 megawatts. 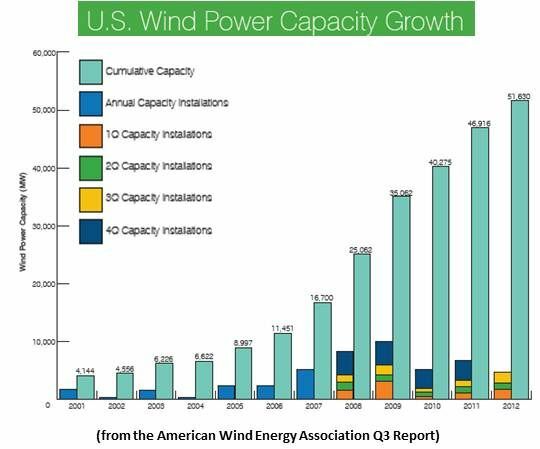 NextEra Energy (NYSE:NEE), the biggest U.S. wind developer, announced it expects to set a company record in 2012 of 1,200 megawatts of installed wind. GE’s 1.6-100 machine is getting wide play for its improved ability to harvest moderate winds, and its 2.5-megawatt machine reached 1,000 units installed this year. Spanish wind giant Gamesa's (PINK:GCTAF) latest announcements tell the story. As part of its 2013 to 2015 plan, it is launching two new wind turbines, a 2.5-megawatt onshore machine and a 5.5-megawatt offshore machine, and developing 7-megawatt and 8-megawatt offshore machines. At the same time, it will lay off 1,800 people in Europe, China and the U.S., just over 20 percent of its workforce, between now and the end of Q1 2013. The latest press releases from Goldwind USA (PINK:XJNGF), a subsidiary of the Chinese wind giant formed in 2010 to go after the booming U.S. market, foretells the short-term future of U.S. wind. It is partnering with developers in Panama on a new project, bringing to over 200 megawatts its four wind project presence in Latin America. It also announced Carolina Galleguillos Gonzalez as Director of South American sales in a press release tellingly written in both Spanish and English. "Considering Iberdrola is already the second-largest wind producer in this country,” Iberdrola Chair/CEO Ignacio Galan said, “we do not need to push a rapid expansion in case regulatory and economic conditions are not suitable." 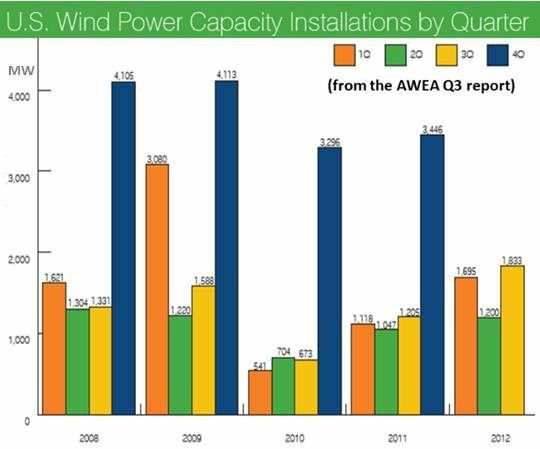 The hesitation in U.S. wind growth could stall a renewables advance that saw all new U.S. electricity generation for September 2012 coming from wind and solar and the cumulative installed electricity generating capacity of wind grow to 4.43 percent of the U.S. portfolio, according to Federal Energy Regulatory Commission statistics. Renewables now constitute almost 15 percent (14.86 percent) of U.S. electricity generating capacity, with solar at 0.29 percent, hydropower at 8.51 percent, biomass at 1.25 percent, geothermal at 0.31 percent and waste heat at 0.07 percent. Gone are the days when advocates for the traditional generation industries could dismiss renewables as playing an insignificant role. It is possible the many utility-scale solar power plants expected to start bringing megawatts on-line next year could take up some of the slack left by wind. The NRG Energy (NYSE:NRG) and MidAmerican Holding (NYSE:BRK.A) Agua Caliente project, the Exelon (NYSE:EXC) Antelope Valley Solar Ranch One project, the BrightSource Energy Ivanpah project, the SolarReserve Crescent Dunes project, and the Abengoa (MCE:ABG) Solana project all may help, along with others, take up the slack created by the wind industry recession. With the biggest renewables supporter ever to occupy the White House now re-elected, it is possible the future of wind and solar and the smart grid is indeed bright. On the other hand, if compromise in Congress extends the PTC for two years or less, the industry could get geared up just in time to wind up once again where it is now in anticipation of the 2014 midterm election. Much rests on how a Congress now facing a fiscal cliff chooses to move.